Suri's site. : My favorite Garfield. My favorite cartoon is Garfield. I think everyone know Garfield, as when I am asking the peoples around me about it, most of them say, “Yes, I know the orange fatso cat!”. Yeah, that is Garfield! Garfield is an orange fuzzy, tabby cat which was born in the kitchen of Mama Leoni's Italian restaurant. Garfield is known to be a bulldozer that gulps anything in any amount, anyhow its favorite food is Langsana. Due to his unhealthy eating habit, Garfield becomes a big fat and slow cat. 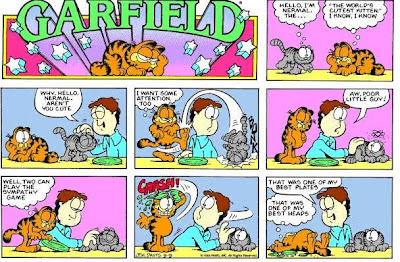 ‘Fatso’ (combination of fat and slow), is Garfield nickname given by his owner, Jon. 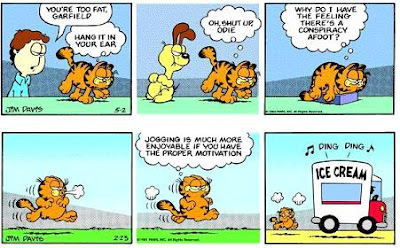 Even with his obesity problem, Garfield really hates to exercise or undergo diet. The definition of diet in Garfield dictionary is a ‘die’ with ‘T’. The funny site of this diet topic is when Garfield always angry to the weighing scale when it shows the value that telling “you are so fat!”. So, Garfield will destroy or throw them away. On the other hand, Jon and Odie always support, encourage and sometimes have to force Garfield to undergo diet and exercise. Another bad habit of Garfield is, he enjoy to tormenting Odie, by kicking Odie off the table, ask him to do foolish things, make him soaked with water, and even hate him for being a dog. On the other site, odie doesn’t really care if he was tortured by Garfield. He always loves, trust, admire and be a loyal follower of Garfield. As of that, Odie always play a sidekick role and Garfield is the hero. Event with out of loud Garfield say that he really hates Odie, especially when Odie lick him with a slobbering tongue, but deep inside his heart, he really need and loves Odie. Garfield is really a jealousy cat. He got jealous when Jon becomes so closed with his girlfriend ‘liz’ and the cutest cat in the world ‘Nermal’. Garfield really fades-up when Nermal try acting cute and admired by the others. Garfield always tries to kick Nermal out of their house and post it to Abu Dhabi. 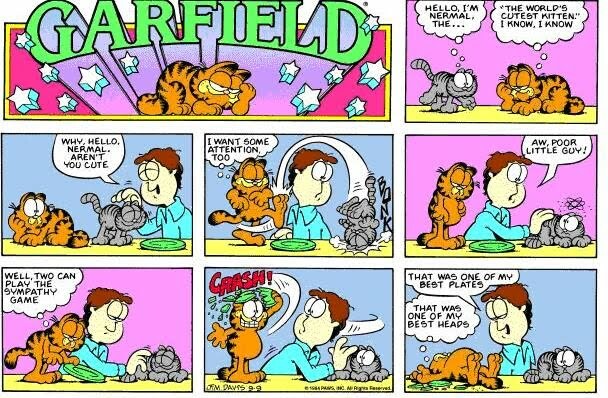 In the same time Garfield tries his best to be noticed and loved by Jon. Other characters of Garfield are he really hates Monday, like to drink strong coffee, like to eat Jon’s fern, like to be in fantasy and imagine things, he like to watching television and dislike to declaw and taking bath. • Love someone as it is without hoping something in return. • There are so many people around you that color your life and you must appreciate them. • It is a gift when you know that someone sincerely love you. • Having a family and friends is such a great gift.